The trigger victimbank can be used by the ETS instructor to add in an exercise. Those patients are not from the incident, they arrive with an ambulance or is coming from another department in the hospital. All trigger patients starts with a T. There is a total of 50 trigger patients. The trigger patients can be used as injects during an exercise. For example if the instructors want to add extra workload toa hospital, they can add trigger patients arriving in an ambulance. 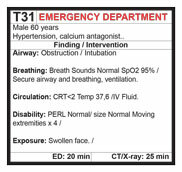 The trigger patients also have a management card and need treatment in the same way as the other patients. The trigger victims are categorized in the same way as the other patients. Some of the trigger patients are categorized in patient outcome categories and are evaluated according to the patient outcome template. 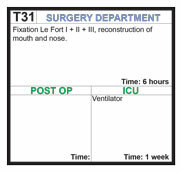 Others have in-hospital evaluation outcomes and are evaluated according to the in-hospital patient evaluation. The Trigger victim bank includes 50 patients and management cards.